The Island of Hawaii is referred to as the "Big Island" because at nearly twice the size of all the other Hawaiian Islands put together. The Big Island is a traveler's paradise and offers an array of activities from swimming and snorkeling to horseback riding and exploring. Most of the resorts on the island are located on the western coast; from Hapuna Bay and Waikoloa to the north on the Kohala Coast, down through Kailua Kona, then to Keauhou Kona toward the south. Here you will find some of the most luxurious resorts in all of Hawaii. Other interesting areas to visit are Hilo and Volcano National Park near the Kiluaea Crater. This is a streaming pan, tilt zoom webcam webcam from the Kona coastline. This still image is a view of Kailua Bay and is updated every 30 seconds. 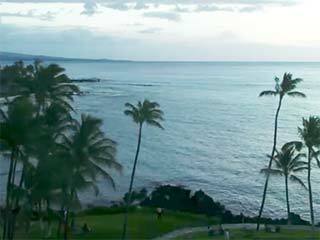 Live streaming cam of Waikoloa Beach from the Hilton Waikoloa Village. This is live streaming webcam of Hilo Bay from the rooftop of the Pacific Tsunami Museum. Two streaming webcams from the Hilton Waikoloa Village Hotel. The large webcam is Flash based and the other is a Java webcam. This live webcam is from the Wailkoloa Heliport on the Big Island looking Southeast towards Kona. This is a flash based streaming pan, tilt, zoom webcam. Several webcams from the summit of Mauna Loa. These views are from the Mauna Loa Observatory (MLO) which is part of the National Oceanic and Atmospheric Administration (NOAA). Many webcams from the Gemini Observatory on Mauna Kea at an elevation 14,000 feet. Lots to see if you are into observatories including numerous time lapse videos. National Park Service host several live webcams updated every 15 minutes or so. In the interior of the island, you can take a drive up the famous Mauna Kea, the world's highest mountain if measured from the ocean floor, rising more that 33,000 feet. It has an elevation of 13,796 feet above sea level. At the volcano's summit you can see a brilliant and clear sky. This is one of the best places for astronomers to scan the skies with powerful telescopes. However, be sure to bring a jacket. Mauna Kea can be snowcapped in the winter! (Yes, real snow in Hawaii). Agriculture is a large part of the economy on the Big Island. Oranges, papayas and macadamia nuts are grown, as well as gourmet coffee in the Kona region. There are around 600 coffee farms overlooking the Kona Coast. Every year they produce over 2 million pounds of coffee, including the famous 100% Kona Coffee. You can go inside and visit some of these coffee farms, have free samples, and buy fresh coffee directly from them. The Big Island is the birth place of King Kamehameha the Great. He was the first king of Hawaii. He was a fierce and very tall warrior who, in 1810, united the Islands of Hawaii. You can visit the original Kamehameha statue, temple ruins and the royal compound while in the Kona area. On the northern end of the island is the Waipi'o Valley. It is a magical place to experience "Old Hawaii." This remote valley is accessed by a scenic road filled with lush flowers, waterfalls, wild horses and a black-sand beach. Take a day or two of your trip and drive to the other side of the island and visit the Kilauea Volcano. This is a once-in-a-lifetime adventure. Spend the day driving around the Volcano National Park and the 11-mile crater rim drive of the Kilauea Caldera. At night, you may be able to walk over and see the bright red/orange lava flowing into the ocean. Be sure and bring a flashlight with you. There is lodging in the Volcano Village area. A helicopter ride above the volcano while it's erupting is another fantastic way to see this incredible hot lava flow into the cool ocean, creating plumes of steam. For the golfers, a trip to the Big Island is not complete without a round of golf. There are several spectacular courses on the Big Island to choose from, including the Big Island Country Club and the famed course at the Mauna Kea Hotel. Rolling fairways, water hazards and an island green are some of the fantastic elements you will find.